This listing is for a VEST that can be attached to different Service Dog harnesses. A HARNESS IS NOT INCLUDED! 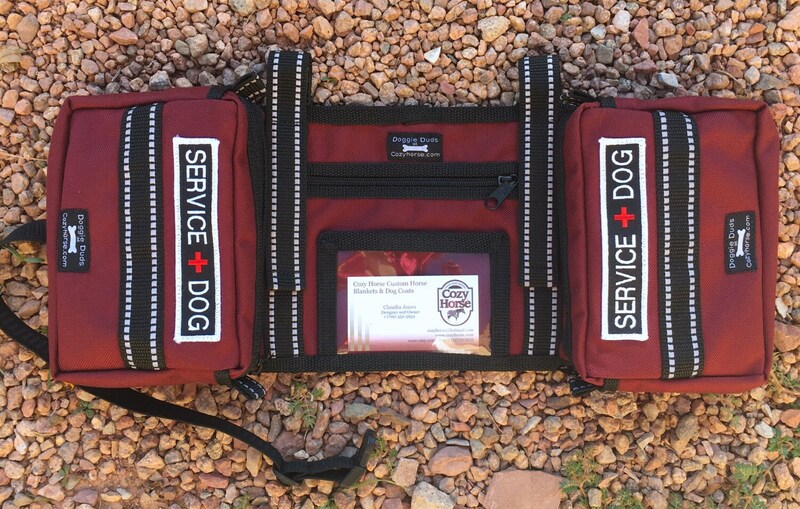 If your Service Dog wears a harness then this may be for you! This vest is very handy and will attach to several different style harnesses. It has two long 1" wide straps that can either run through the D rings of a harness or wrap around a harness that does not have D rings. The straps fasten onto themselves with industrial strength velcro and also have a small padded area with a grippy material to help stabilize the vest should it be used on a harness that does not have D rings. The side pockets on this design are much deeper than on my original design and this vest also offers a zippered center pocket, a large clear ID pocket and two embroidered SERVICE DOG patches. It also has lots of reflective stripes to help keep you and your dog safe and visible while out at night. Straps for attaching to a harness are set approx. 7" apart but do have some wiggle room. Shown attached to a guide dog harness made by Hilason and also shown on one made by Activedogs. Once again, a harness is not included in this listing! They are only shown to convey how this product works! This is a free standing vest as shown in the second picture! For medium to large dogs 45 - 90 lbs. Light weight, not bulky and fits well. Thank you! Got here on time, belly strap was a bit too big for my 49 pound Lab. Otherwise I absolutely adore it.